Scout Niblett is like a bizarre cross between Nirvana and Bjork - with the former's rawness, powerful yet spartan aesthetic, and passionate intensity; and the latter's eccentricity and vocal capriciousness. Her music is, I have no doubt, not to the taste of many. But if it is to the taste of Will Oldham (who appears on four of This Fool Can Die Now's songs - watch and listen to the two of them on the video to brilliant single 'Kiss') and Steve Albini (who engineered the record), she arguably shouldn't worry too much. It's not necessarily easy to approach Scout Niblett for the first time. Until I saw her play live, I had doubts. I'd found myself frustrated or annoyed by the couple of songs I'd heard (fleetingly) - hastily categorising Niblett as a rather over-'quirky' artist who ought to pay a bit more attention to her guitar's tuning. It was only when I engaged with the music in a live context that I became conscious of its intensity and seriousness - quite the reverse of the trite glibness and forced idiosyncrasy I'd originally identified. I think one of the most engaging things about Scout Niblett is the extraordinary synthesis that her music creates between Grunge, punk, country and folk. Despite her American accent (she was born in Nottingham), there is something absolutely, indubitably English about her melodies, which feel rooted in English folksong. Not enough interesting is done with the English folk tradition - its purveyors are all too often either guilty of facile and derivative bolt-on-folk stylings or guided by sentimental, risk-averse traditionalism. Nobody, I think, is going to accuse Scout Niblett of derivativeness or risk-aversion. Bipolar grunge-lullaby 'Let Thine Heart Be Warmed' neatly exemplifies this synthesis, pairing modal folk melodies and savage distortion. Probably the best song on the album, it is sensational live, and the recording does a fantastic job of capturing the vital - hugely energising - dynamic contrast between verses and chorus. The metallic ringing and scraping of cymbals in the background (complementing bowed steel pedal notes) works well, serving to draw the listener right in, before bludgeoning him/her with the sonic assault that is the chorus. Production touches such as this help offset Niblett's tendency toward wilfulness and obscurity - in the same way that her presence and performance provide a key to the songs, live. I'm not sure that previous recordings of Niblett's songs have focused attention as successfully on the more attractive aspects of her music. Perhaps a tendency towards brittleness and sparseness has been partly responsible. Often, a pared-down production ethic (of the sort that is Albini's trademark) may act to remove veils of grandiloquence, pomp and overcomplication that marrs many artists' output - allowing the essential qualities of the music to shine without artificial polish. In this way, Albini often helps bands trim off excess (metaphorical) fat. Scout Niblett (I suspect literally as well as metaphorically) didn't have much of that to begin with. And I've tended to feel that previous records such as Sweet Heart Fever suffered from under-production. Their edges are a bit too rough. Just as indulgently-produced, multi-instrumental bands may frequently benefit from the stripping-down treatment, so may an aesthetically spartan artist like Niblett benefit from a touch of the reverse. ... And that's where This Fool Can Die Now succeeds. It is by no means a 'produced'-sounding record. But it has the vaguest hint of varnish. And I mean vaguest. Emphatically. Don't - please - come to it expecting Everything Must Go string arrangements. I'd like to leave you with an ardent request: watch the video for 'Nevada', below. Do it now. 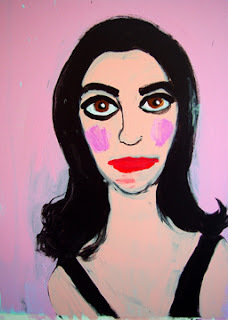 Lately, I have been listening to PJ Harvey. Copiously. Rid of Me. Setting aside Nirvana's In Utero (no prizes for spotting the common denominator here), I'm struggling to think of an album that rocks more than this. I mean properly rocks. In what I like to call a real-full-on-you-sound-like-you-are-properly-on-the-edge kind of way. The choice of opening track ('Rid of Me') is bang on. It encapsulates pretty much everything the album is about. The production is inspired. As is the fact that PJH makes you wait through 24 bars of cycling palm-muted guitar and brushy drums before singing the first line. Rebecca and I were talking about Albini's production, last night. There's definitely the sense of being in the rehearsal room with the band. Especially if you listen to the record on headphones (and - oi! - I mean good headphones). In the dark. ... Just don't do the above if you're planning to drop off to sleep straight afterwards.